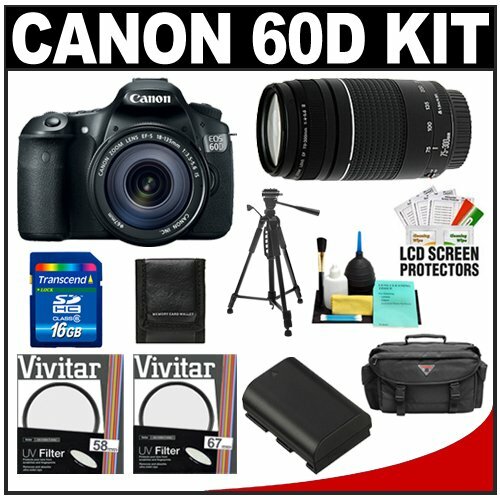 The Canon EOS 60D features an APS-C sized 18.0-megapixel CMOS sensor for tremendous images, Full 1080p HD Video, DIGIC 4 Image Processor for fine detail and superior color reproduction, and improved ISO capabilities up to 12800 for uncompromised shooting even in the dimmest situations. It features a refined Vari-angle 3.0-inch Clear View LCD (1,040,000 dots) monitor, supercharged Live View Function with Face Detection Live Mode, HDMI output and much more. The Canon 18-135mm IS Lens boasts a 35mm equivalency of 29-216mm when used with a Canon APS-C EOS Digital SLR. Measuring just 4″ in length and weighing about a pound, the lens offers a convenient wide angle to telephoto focal length. The Canon 75-300mm III Lens 4x telephoto zoom lens ideal for shooting sports, portraits, and wildlife. The improved zoom mechanism makes zooming smoother than ever and the lens an absolute pleasure to use. Features 13-element optical system and time-tested DC motor for accurate and quick autofocus. Increase your shooting capacity with this powerful LP-E6 Lithium-ion rechargeable battery.